Ventilation manufacturer Nuaire invented a new strategy for curing condensation and improving air quality over forty years ago. Today, Positive Input Ventilation is one of the most popular form of whole house ventilation in the UK but homeowners still know little about it. Nuiare Residential Estimator, Llyr Davies explains. Most new and older homes will feature some form of ventilation, whether it be extract fans in the bathroom or kitchen, trickle vents in the windows or, normally a feature in older properties, airbricks in the walls. Single room ventilation is effective at reducing moisture levels and cooking odours from individual rooms as long as they are running or if windows and trickle vents are open, but if your property suffers with condensation and you don’t want to lose heat during the winter months then a more robust strategy is needed to force the moisture-laden air out of every room rather than moving it round the home. Condensation is caused by excess moisture in the air, and a lack ofproperty ventilation. The moisture is released from everyday activities, from washing and drying clothes indoors to cooking and bathing. The trapped moisture travels around the home where it collects on cool surfaces such as external walls, windows and frames, mirrors and furniture, causing condensation and over time mould patches will form. 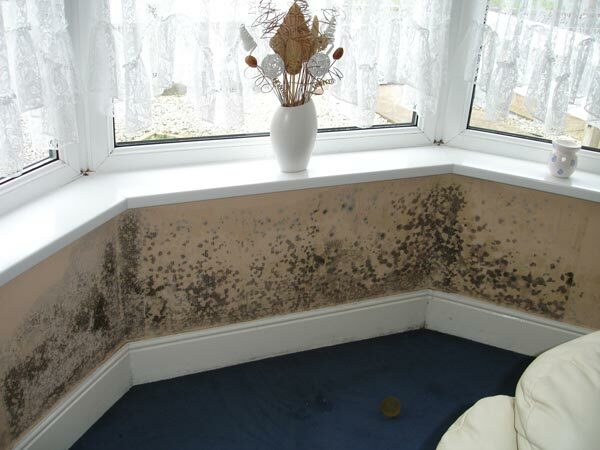 Condensation leads to the growth of poisonous mould spores. These spores are breathed in by occupants and cause a range of respiratory and skin problems. The humid environment is also a perfect breeding ground for dustmites, present in the cleanest of homes, to multiply in huge numbers. Another allergenic, dustmite faeces is a trigger for asthmas sufferers and can lead to a range of allergic symptoms. A further consequence of not adequately ventilating your home is the build-up of air-born pollutants, including cigarette smoke and fumes released from cooking, painting, and using cleaning products, and also the external pollutants that enter the home – traffic fumes, pollen, and in some areas, Radon Gas. Positive Input Ventilation is the only ventilation method that can cure condensation in a property whilst also reducing the pollutants in the air, helping to create a fresh, healthy environment. This strategy is extremely cost effective to run using an average of 0.16 watts/litre/second, and costing approximately 1 penny per day to operate. 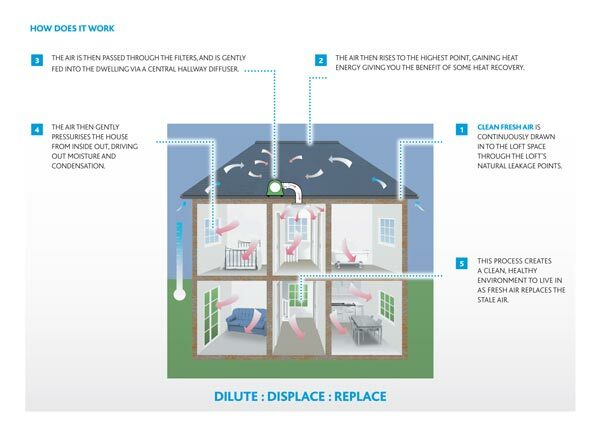 As a whole-home ventilation strategy, one system provides effective ventilation for the whole property, however if your home has a remote wet room, for example, an en-suite bathroom off a bedroom and not directly off the main landing, you will need to install an extract fan to meet building regulations. PIV is quick to install and is suited to both new build and retrofit projects. As with any other energy-using product, a PIV system should be installed by a qualified electrician as it requires hard-wiring. Nuaire’s Drimaster range will cost between £210 and £300 and a qualified installer will charge between £50 – £100 to fit your system. As PIV is a whole-home ventilation method, in most cases you won’t need to install separate extract fans in wet rooms, unless the layout of your home means that these rooms are internal. Installation takes a few hours, and is non-disruptive as the unit is fitted in the loft, out of site, and there are no holes to knock through external walls or windows. You can see more about the Drimaster on Nuaire’s site. So Which Properties Are Suited To PIV? The majority of systems are designed for loft installation. Nuaire’s Drimaster product range, for example, makes use of the warm air that rises to the loft space, recirculating the heat at ceiling level in your landing. For homes without lofts, some manufacturers offer systems that can be mounted in the hallway, and work on the same principal as a loft-mounted PIV system but without the benefit of utilising the loft heat. This style of PIV system, however, has another clever use as it also provides ventilation for basements, cellars and garages. Whether you live in a property with or without a loft, you should choose a PIV system that is energy-efficient to operate and has low maintenance requirements. If you have questions or need advice on which system is right for you, don’t be afraid to contact the ventilation manufacturer and speak to a technical advisor. It’s important to get advice based on the layout of your home and your individual needs. 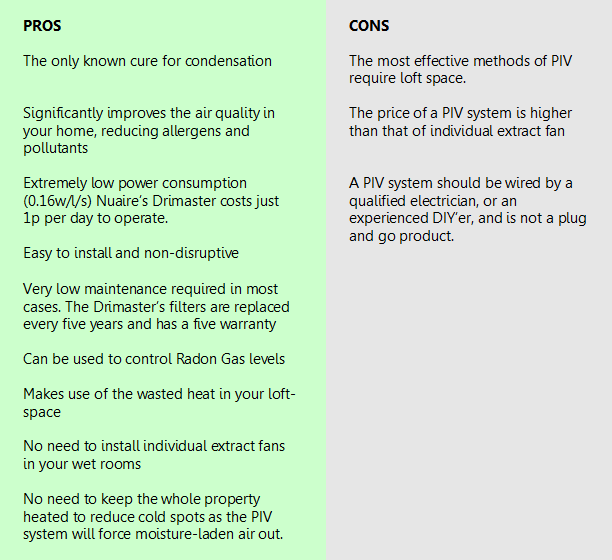 Read DIY Doctor’s project on the causes of Condensation in our Projects section.